Consenting to Grace, a textbook on the theory and practice of Gestalt Pastoral Care, was published by Penn House Press in 2006. Full of personal stories, theological reflection, practical teaching, and spiritual wisdom, this book is loosely based on the curriculum of the Gestalt Pastoral Care training program. ~ Bishop Jane Allen Middleton, Susquehanna Conference, The United Methodist Church. 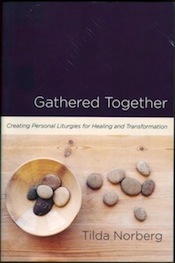 Tilda Norberg shares many concrete suggestions on how to create personal liturgies that fit the inner language, physicality, worship tradition, and personal experience of one who has reached some kind of turning point. Norberg details more than two dozen tailor-made liturgies she has created for just one person at a time, and led among an "ad hoc church," a small group who gathers to pray in this special way. These liturgies honor such specific events as finding a vocation, recovering from illness, giving up false hopes and receiving first car keys. Personal liturgies are truly faith in action - intimate, honest and deeply transformative- as a congregation of close friends participate with the celebrant in a service uniquely designed around a personal need. “Tilda Norberg gives creative voice to the church’s calling to liturgically honor and appropriate God’s gracious movement toward healing and wholeness, one person at a time. Gathered Together is a generous gift to the church from an exceptionally insightful, wise, and gifted pastor.” Bishop Jeremiah J. Park, New York Conference, The United Methodist Church. Available from Upper Room Books or Amazon. Threadbear, an illustrated storybook of Christian healing for adult survivors of sexual abuse, is a composite story told as one woman’s journey through tumultuous emotions and spiritual ups and downs as she works and prays toward wholeness. With the help of her Gestalt Pastoral Care guide, she discerns that Threadbear, her tattered old stuffed animal, holds both her horrifying memories and the answers to some of the most profound theological questions. The story witnesses to the power of God to heal and transform even the most damaging experiences. “Threadbear is the best resource on sexual abuse that I've read in my 30 years of working as a clinician and as a seminary professor teaching human sexuality. This sensitively written book is both realistic and hopeful. Tilda Norberg's seamless integration of psychology and Christian spirituality is profound. She compromises neither discipline as she weaves them together into a tapestry that speaks truthfully and powerfully of the soul-shattering betrayal experienced by a child at the hands of a trusted person. Joyce Thomas' simple, line-drawn illustrations are terrific. I'm ordering ten books for my counseling staff." -Carol Schreck, Associate Professor of Marriage and Family, Palmer Theological Seminary. Available by contacting Gestalt Pastoral Care, Inc. at info@gestaltpastoralcare.org. Ashes Transformed witnesses to the power of God to heal even the worst tragedies, including the pain and grief that disrupted our lives one September day. The heart of this book is a collection of 43 true stories told by people who experienced God's presence in connection with the terrorist attacks, accompanied by prayerful suggestions of how to open to healing grace. “…This book will go straight to the top of the list for my seminary course on recovering the church’s healing ministry.” ~Lawrence M. Yoder, PhD, Professor of Mission Studies, Eastern Mennonite Seminary, Harrisonburg, Virginia. Stretch Out Your Hand offers practical ways for us to consider the varieties of God's healing love for individuals, institutions, and communities. Norberg and Webber's book provides an honest examination of the many difficult questions about prayer and the role of faith in healing. Through exercises and stories, the authors reintroduce readers to Jesus' healing ministry and to his vision of the church as a healing community. They open to us the basic understanding that healing prayer is more than getting well from an illness – healing prayer is part of a beautiful and dynamic process leading to the wholeness God wills for us. This book can be used in study groups. A Leader's Guide has been published as a separate booklet. Available from Upper Room Books or Amazon. The Spanish translation of Stretch Out Your Hand . The Chocolate-Covered Umbrella: Discovering Your Dreamcode is available from Upper Room Books (Fresh Air imprint) and Amazon. GPC has reprinted an excellent case study written by one of the inmate Gestalt Pastoral Care students.